Lisa Peck at YCO tells me that Ben Bartlett's central agency for sale, the 32.72m sailing superyacht Wally B, has been reduced in price. Delivered from the Pendennis yard in 1998, Wally B has proved to be a highly successful yacht on the charter circuit, sleeping six guests in a master and two doubles. She's just completed another excellent Mediterranean season with over 10 weeks of charter booked, guaranteeing a regular income for her new owner. 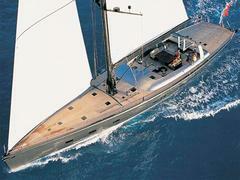 Previously offered at €6.5 million, she's now asking €5.9 million.